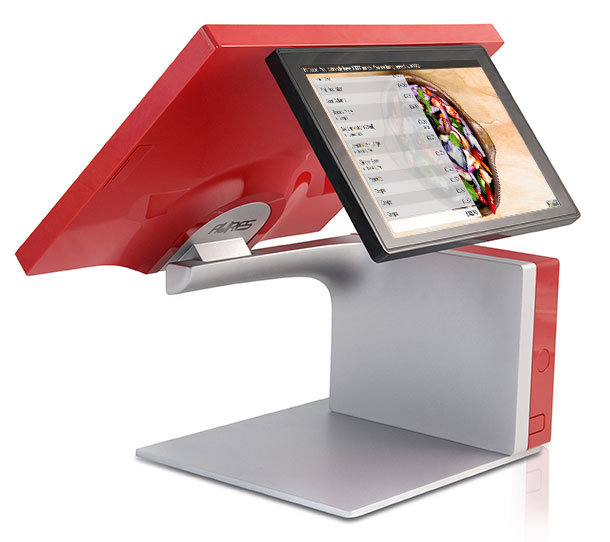 Customer facing screens add a fresh new dimension to the EPoS system in your bars, restaurants and QSR venues, allowing you to present fully custom promotional messaging to guests – and even passers by if your tills are visible from the street. 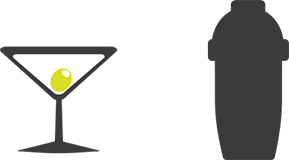 Create powerful slideshows of imagery, shown on automatic rotation, to entice customers, increase sales and strengthen brand presence in your venues. In addition to the promotional slideshows, customer facing screens also give your guests a real time view of their orders as they are being placed, highlighting discounts applied to items and any configuration options that have been selected. This increases the perceived value of your offering and decreases the chance of mistakes being made while orders are placed. The basket view gives your guests a friendly welcome from the member of staff serving them, and you are also able to upload a custom basket background, providing a great opportunity to tempt guests with last minute upsells and encourage them to sign up to your loyalty scheme, or present their card. 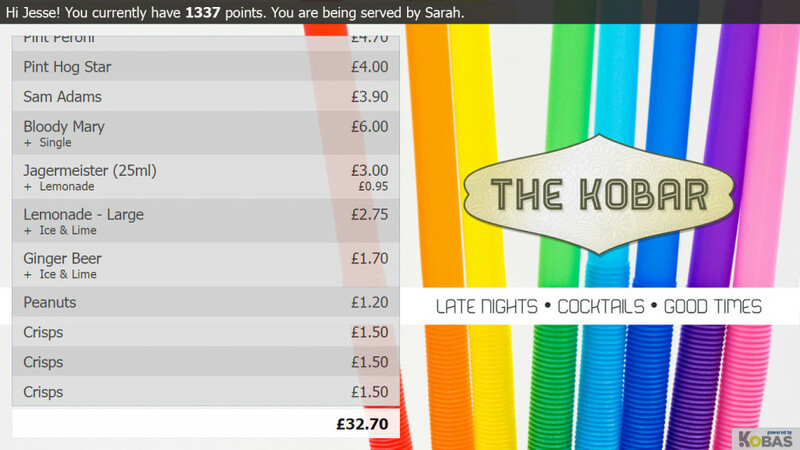 Once a loyalty card has been scanned, the screen will show guests their points balance and even greet them by name! Perfect for positively reinforcing their return visit and making them feel good about the rewards they have earned. 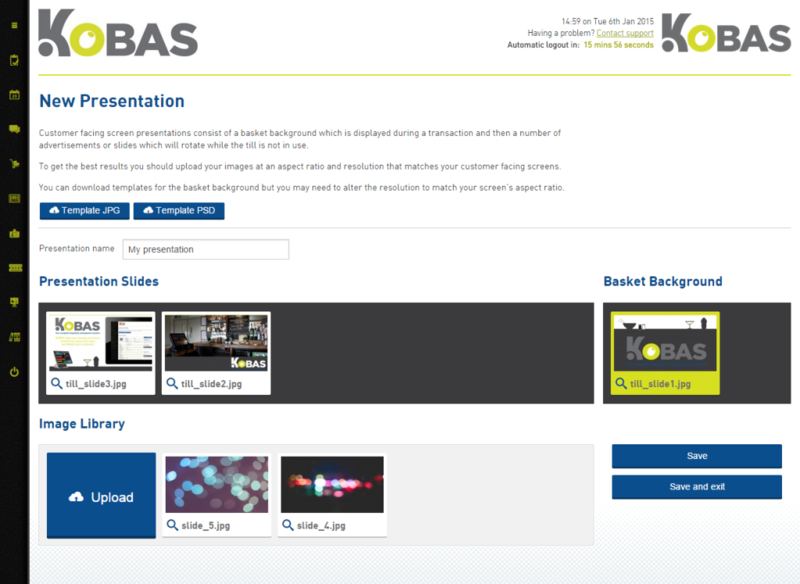 All customisation can be easily managed from your Kobas Cloud account, alongside our full suite of hospitality management tools, and can be customised on a per venue basis. We’ve built a brand new drag and drop interface that allows you to create presentations in seconds and managing your presentations is easy as pie.